Could one of the F-35’s greatest strengths become politically unusable? Over the past six years, few weeks have gone by in which analysts could say “Everything went well with the F-35 program.” The latest problems involve concerns about aircraft performance,amidst claims by foreign pilots that currently operational competitors (such as the Eurofighter Typhoon) can easily outclass the Lightning II. The same concerns obviously arise in context of comparison between the F-35 and the latest Russian and Chinese fighter aircraft. F-35 advocates are quick to make the (appropriate) point that future aerial combat is unlikely to require the kind of capabilities that the F-35 lacks. Rather than nifty dogfighting skills, the fighter of the future needs to operate in a networked environment, capable of seeing, talking, and killing at standoff range. Advocates expect that the F-35 will fight under rules of engagement that allow Beyond Visual Range (BVR) engagement, and that advanced, networked sensor capabilities will solve the problems normally associated with BVR (the threat of shooting down civilian aircraft) by effectively eliminating the fog of war. This is a genuinely fascinating, even compelling, vision of future aerial warfare. On its own terms it makes sense, not so much answering as bypassing the common critiques of the aircraft. However, this vision has the potential to founder on two political realities. The first is that if, as advocates say, the capabilities of the F-35 metastasize (in terms of sensor reach and communications capability) as the fleet grows, the great cost of the aircraft runs the risk of reducing the numbers below a floor sufficient for carrying out this grand vision. This is especially true of U.S. partner nations, which will fly much smaller fleets of aircraft. Perhaps more importantly, rules of engagement are inherently political. Civilian leaders, and their politically attuned senior military counterparts, will draw up guidelines for combat in context of political, not military, necessity. 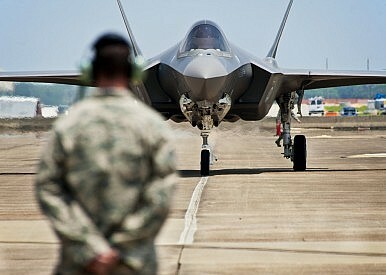 If the F-35 can only operate successfully in BVR context (and to be sure the networking capability of the F-35 make “BVR” a different proposition than with past aircraft), and if the civilians restrict the ability of the aircraft to operate under such conditions, then the utility of the fighter comes into grave question. This question is hardly academic, as potential peer competitors of the U.S. (including Russia and China) will undoubtedly take political steps to limit the ability of the F-35 to fight at full capability. Again, this may be even more true of the partner countries in the F-35 program, which often suffer from more rigorous political restrictions that U.S. forces. The larger problem is that none of today’s major players have serious experience with fighting high end aerial combat against an advanced peer competitor. Most sophisticated air forces have invested heavily in experimental learning, in the form of Red Flag and its various clones around the world. These efforts place air forces light years ahead of their 1960s counterparts, which found (in the case of the United States in Vietnam) that actual air combat bore little resemblance either to earlier wars or to extant theoretical studies. Nevertheless, even the best experimental learning settings cannot replace experiential learning; combat in real war conditions, beset by all of the political baggage that necessarily afflicts military operations. Investing in an aircraft that can only maximize its potential in a particular, unusual political environment carries serious risk, and at the very least operators need to work out the implications of operations across the spectrum of political commitments.